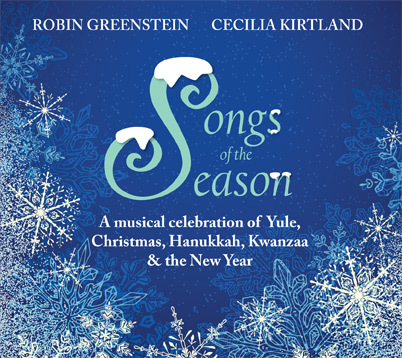 "Songs of the Season" is a CD of music from a show that Robin Greenstein, along with Cecilia Kirtland, has been performing for the past decade in the NY metro area. 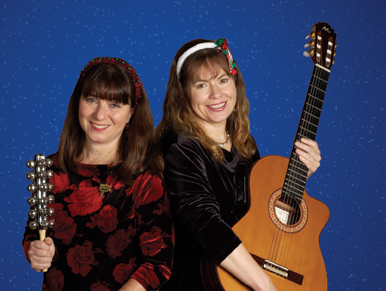 It is a multi-cultural, multi-lingual collection of music from the major winter celebrations of Yule, Christmas, Hanukkah, Kwanzaa and New Year's, sung in English, Spanish, German, Hebrew, Ladino, Yiddish and Yoruban. Robin and Cecilia go back to the Guitar Workshop in Roslyn, NY, a legendary music school where they were both guitar students, and eventually teachers. Their friendship spans decades and they have made music and sung together over the years. Around 2000, in response to a booking request, they put together a concert program based on their respective holiday traditions and "Songs of the Season" was born. Robin is Jewish and grew up with the music of Hanukkah and Eastern Europe. Cecilia's mother is Chilean, so her Christmases had a hispanic influence. Their love of folk music led them to incorporate other ethnic music from Germany, Sweden, Puerto Rico, the Baltics, etc. The CD has a combination of holiday favorites along with some new classics, music for Kwanzaa and an original Hanukkah song by Robin. For more information on their show, which they have performed at dozens of libraries, schools, colleges, historical societies, etc, click here. The CD runs 45 minutes in length and features Robin and Cecilia's gorgeous harmony vocals and intricate guitar arrangements. You can purchase "Songs of the Season" directly from this website. Digital Downloads are available at CDBaby and other digital e-tailers. 10. Mele Kalikimaka (Alex Anderson) - Merry Christmas in Hawaiian! Sue Klied - flute on "Deck The Halls"
Lisa Gutkin - fiddle on "Chanukah Medley"
Rob Stein - pedal Steel on "Mele Kalikimaka"
Or you can purchase the hard copy CD here.